Aimovig, Erenumab, Migraines, Oh My! There is a new migraine prevention medicine out there that is causing a lot of excitement in the chronic migraine sufferers of the world. Aimovig/Erenumab is the first and only FDA-approved Calcitonin Gene-Related Peptide (CGRP) receptor blocker and my friends who have been battling debilitating migraine pain for years are eager to try it. You can learn more about this at Aimovig. It is available by prescription only and right now reports are coming in that the manufacturer has been overwhelmed by the demand and there may be a wait to get this self-injectable monthly migraine preventative. That is the case for any medication, my friends. It will help some more than others, and often for reasons we don’t know or understand. But it is definitely worth having a conversation with your doctor if you suffer from chronic or episodic migraines and you have tried all of the usual suspects without lasting relief. The manufacturer is careful to say that it will lessen the number of migraines you have, not eliminate them completely. When your mouth and tongue feel like they are on fire, the last thing you may be thinking of is going for a dental checkup or cleaning. Just the thought of someone messing around in your mouth, poking, prodding, and merely keeping your mouth open for that long can be daunting. But the consequences of leaving your teeth uncleaned and untreated can be so much worse than a temporary discomfort. I go for checkups and cleaning every six months, and can always call if I am experiencing any pain or discomfort. In nearly ten years, I have not had another cavity or issue due to this regimen and chewing xylitol gum whenever I chew gum. Will I eventually need a dental procedure? Odds are good. I have one crown that has its enamel chipped off and another molar that is under close watch, so dental work is definitely in my future, but since my dentist knows my history we are waiting as long as possible to do anything that might have the side effect of worsening the burning. It will be unavoidable at some point, but we talk about it each time I visit and I trust that he will do the right thing at the right time. So, when is the last time you went for a dental checkup? If it has been over a year, please take this as a reminder to take care of yourself if you possibly can. Prevention now can keep you from more pain later, and that is always a good thing. I have been battling oak pollen allergies since the beginning of April. We got a good rain for a day, and a small respite, but the levels are back up in the medium category today and I feel it. Burning Mouth Syndrome is a foe I have been battling for ten years now (Mother’s Day will mark the 10th anniversary…Yay?) and I have noticed a pattern that arises when I am forced to take decongestants along with my antihistamine because nasal congestion is rocking my world. There is no doubt in my mind that the drying action of the decongestants, although needed and effective for the life-sustaining action of breathing, also irritates the burning neuralgia of BMS. In spite of adding quarts of water to my intake, the pain has been nearly unbearable some days. When added to a string of migraines, triggered by sinus pressure, it has been a tough time. I found myself looking forward to that next dose of Klonopin/Clonazepam so I could doze, even if I didn’t really have time to do that. To sit in my chair, watching TV with my husband, and just drifting off to sleep where the pain was not present was a gift on those high-burning days. But what do you do when you have things to do, people to see, and responsibilities that are not subject to rescheduling? What do you do when there is a once in a lifetime event going on, and you can’t afford to miss it? Cannabis for Burning Mouth Syndrome? 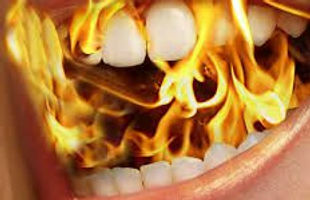 As many of us do, I haunt the online forums looking for new information or even unusual coping strategies for Burning Mouth Syndrome. Interested in learning more about this mysterious chronic oral pain? Check out the BMS Support Website. You see, primary BMS is invisible. I am not kidding! If a doctor (and believe me, I have had quite a few) looks into my mouth and throat even when I am burning most intensely, they will see nothing unusual. That is a hallmark of this syndrome and if you have visible symptoms, please seek a different diagnosis. It may be another condition that has a cure or medicines that can better treat your symptoms. Yesterday as I grabbed my morning coffee at the neighborhood shop, I spotted an acquaintance. I had seen her around the gym where she is always intense and focused but had only spoken with her once or twice over the years. I said hello and reminded her who I was (You know when you get that feeling that they know they know you but might not remember your name or the context?) and we stood together waiting for our orders. Click the image to visit the BMS Support Website!